Organizations are adopting a more holistic approach to resilience planning to adapt to today's global market. 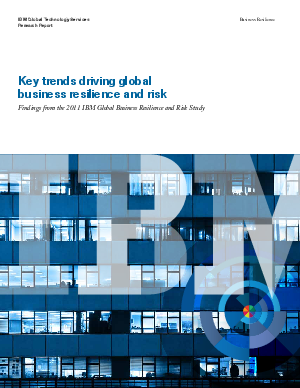 In "Key trends driving global business resilience and risk", IBM Global Technology Services presents the findings from its 2011 IBM Global Business Resilience and Risk Study, which shows that more and more businesses are developing a holistic approach to risk management over the next three years. Resilient organizations are able to maintain continuous operations and protect their market share in the face of disruptions such as natural or man-made disasters. They are also equipped to seize opportunities created by unexpected events. Learn how respondents, including nearly 400 senior executives from some of the world's largest enterprises, are incorporating holistic business resilience planning into their businesses through top-level findings and case studies. Download the research report here.